House Plans - Did you do the architectural plans for this house? If so, would you consider drawing up a similar exterior with a different floor plan? I'm going to build in the next couple of months. The home would be in Texas. Hi. I am in the beginning stages of designing a home on the Bayside of the Emerald Coast and am sincerely intrigued with the exterior home plans of your home. Would you be willing to share with a cost associated? Hello Kristen, which home are you inquiring about. Some of our designs are for resale and some were custom designs that are not. Siding and plans - Hello! We are updating a farmhouse built in the 1800's. This front elevation looks very similar!! Would we be able to get the plans? Also, what siding and paint was used? Lamps - What size are the gas lamps? Bevolo? Can we see a floor plan for this beauty? This was a custom home that the client owns the rights too. I am unable to share their drawings. Beautiful home! - This home is exactly what my husband and are looking for. Can I get a copy of the floor plan? My email is Kimjonesdesigns@gmail.com. Thank you! Which windows are used here? - What brand and color are the Windows? Silverline Window makes a window that looks like this, but don't know for sure that's what this is. I love the door. Was this custom? - Do you recall if door was custom? Building barn style home and this style door would be perfect. Thank you. It was a custom door. I am not sure the maker. Exterior plans! - What color is the paint on this house? We are an architectural firm and only provided the plans. I do not know what the homeowner chose for the finishes. Roof Pitch - Do you know what the roof pitch is ok the porch? Paint color - What is the paint color on exterior? We only provided the architectural drawings. I am not sure their finish selections. Siding and roofing - Can you please tell me the type and manufacturer of siding used? Ditto for the meta looking and manufacturer. Also colors for both? Thank you. We only provided the architectural drawings, so I am not sure what their material selections were. house plans? - do you happen to have the floor plan and square footage for this N. Maney Avenue home? This is beautiful. Hello... unfortunately this was a custom design for a client and these plans are not for purchase. Exterior - Hi, j know you only drew the houseplant but would you happen to know what kind of material was used for the exterior? Thank you! It was a Hardi Board material. Houseplans - Do you have the house plan on your website or how can we see it? This particular house was a custom design and these plans are not for resale. Square footage - This is a beautiful house! My husband and I are in the very early stages of looking to build a house and I would love to know what the square footage of this house is if you are able to share. Thanks! Windows - What windows were used to get the dark frame on the outside and light color frame on the inside? They look to be steel windows in the outside pictures. Beautiful work. I only provided the architectural work for this client. However, many window manufacturers of two tone window options. Exterior - How wide are the batons and what is the distance between them? I only provided the architectural drawings. I am not sure. I would say they are at a 2' spacing. I would love to see the floor plan sketch if possible. This was a custom home for our downtown area and I do not have this home design for review or sale. Hi! Exterior color please? Thank you. I only did the architectural work. I do not know the finishes. Love the black windows! Who makes them or are they custom? I think they are actually Bronze. I do not know the window company the homeowner when with, but just about all window companies offer a bronze option. It may just be an upgrade. Love the front door! Who makes it and can you tell me the style name? Exterior paint color... - What color is the exterior paint? Where can I see this house plan please? Metal Roof Color? - What color is this metal roof? And is this standing seam? 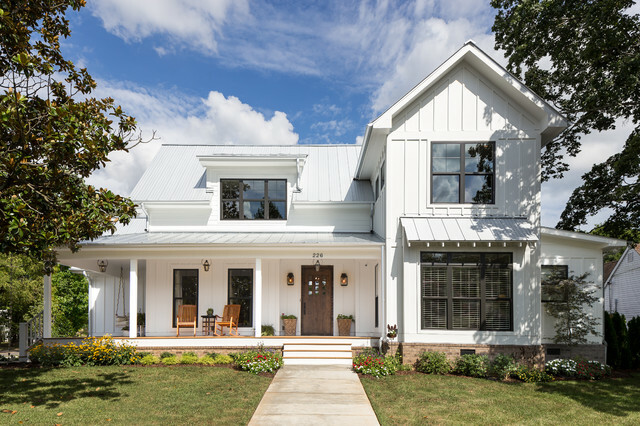 Paint - Do you mind sharing exterior color of the modern white farmhouse on Mulvaney? What color white paint did you use on the exterior? Can someone contact me about this house plan? - I would like to see this house plan? Roof pitch - Can you tell me the roof pitch? Thank you. Love the exterior - How could w e see the floor plan? Love the look of this house! Curious what the square footage is? Love the black windows? Who makes them or are they custom? kind of what Leslie proposed for front of our house.